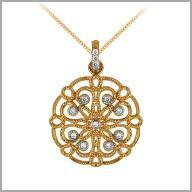 14k gold pendant with 0.1625ct of diamonds. Sweeten your style with indulgent designs of sophistication. 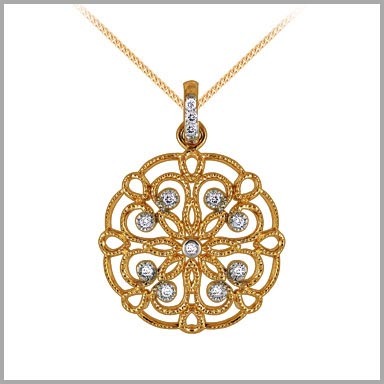 This pendant is crafted in polished 14K yellow gold. Each detailed openwork design features one full round cut diamond in a bezel setting at the center and eight full round cut diamonds in prong settings all around. The total diamond weight is 0.1625ct with a color of G-H and a clarity of SI. They measure 7/8" x 7/8" and have a 5/16 bail with four diamonds.Include an 18" chain.